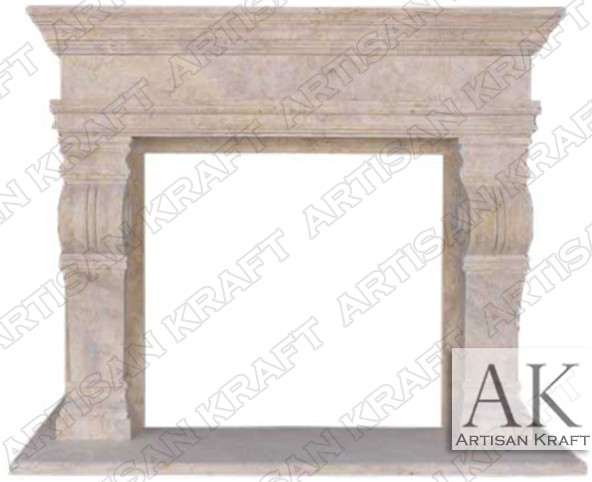 Melrose fireplace mantel is made from travertine. This transitional style fireplace can be placed in any California home. Bold and rustic with straight lines, steps and curves reminiscent of the Art-Deco Styles. A contemporary feel with two large corbel legs and a heavy shelf. Oversized features and massive in size making its presence known. Travertine is pitted giving it a rustic aged look. The stone itself is a reminder of the California vast and diverse terrain. Typical Dimensions: 70″ wide x 53″ high *can be made to custom dimensions.